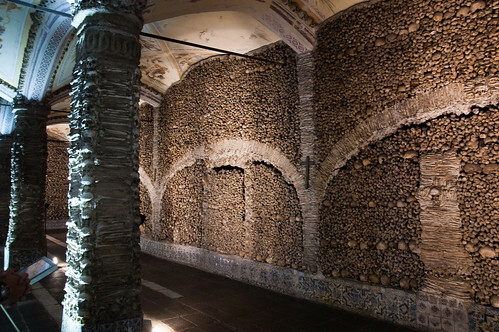 Chapel of Bones (Capela dos Ossos) in Évora, Portugal is an eerie chapel with spine chilling atmosphere. 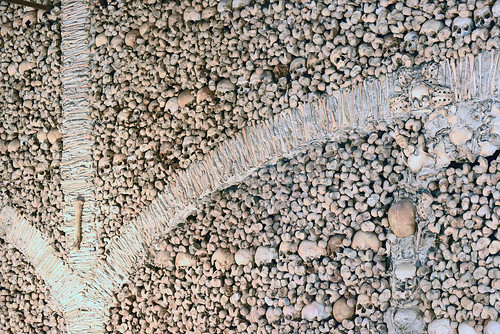 Entire surface of its walls and pillars, from top to bottom, are covered and with human skulls and bones held together by plaster. 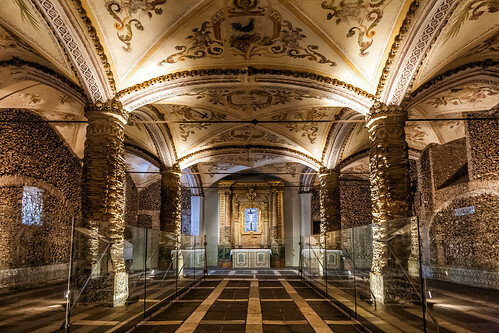 The chapel was created in 16th century when it was decided to close down 42 monastic cemeteries so that the land occupied by the cemeteries could be released for other uses. 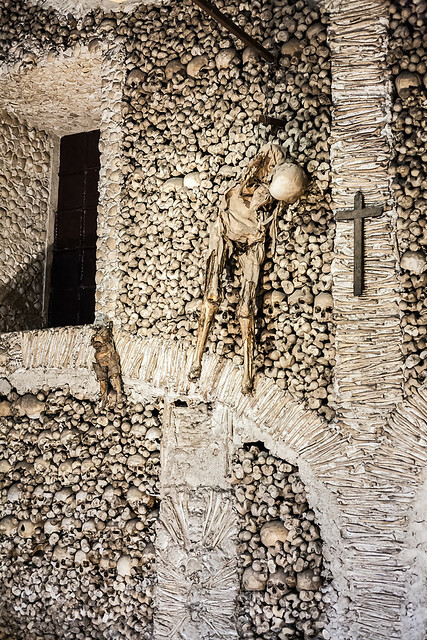 About 5,000 skeletons from the cemeteries were exhumed and re-consecrated into a single chapel. The chapel is formed by three naves, about 18.7 metres (61 ft) long and 11 metres (36 ft) wide. Its white plastered roof is supported by 8 pillars fully decorated with bones and it is painted with allegorical motifs to death. The entrance to the chapel has a grim warning for the visitors. An inscription at the entrance says in Portuguese "Nós ossos que aqui estamos pelos vossos esperamos" ("We, the bones that are here await yours"). 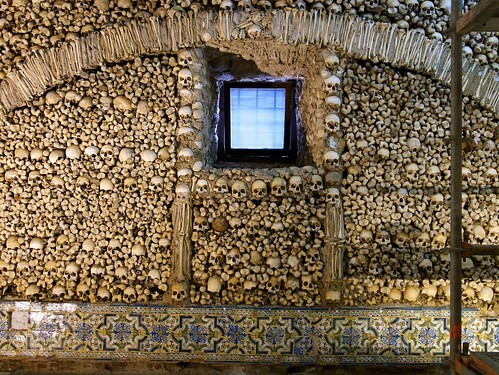 In words of Evora-Portugal "The Capela dos Ossos (Chapel of Bones) is a fascinating chapel with a very macabre atmosphere. 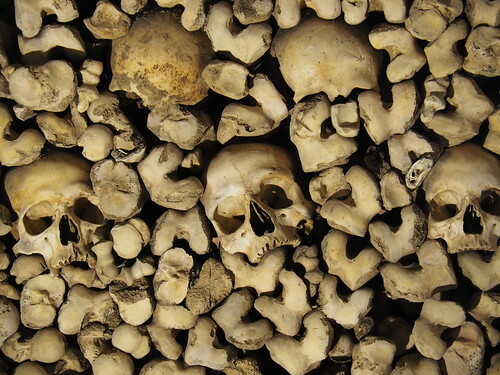 Ranking as one of Evora’s most visited sites, this eerie tourist attraction is not for the faint hearted." 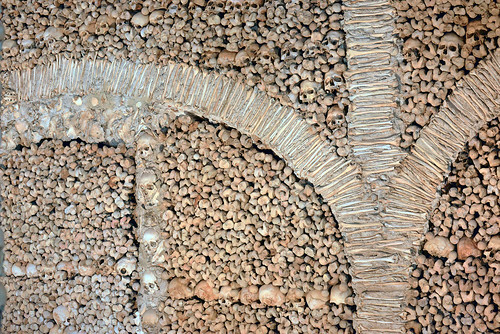 Note: The Chapel of Bones at Evora is not the only chapel decorated with human bones. 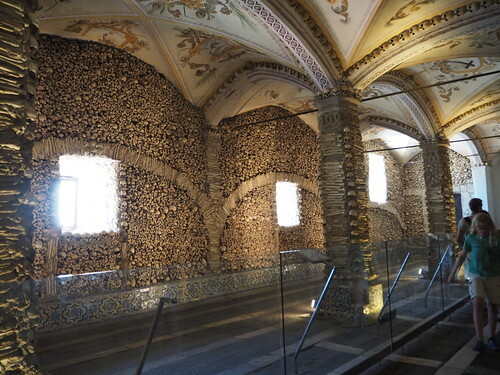 The Sedlec Ossuary in Czech Republic covered earlier in this travelogue is another example. Few more have been listed in Wikipedia. I have just stumbled upon your blog but I wish that I had found it years ago. You have retained a childlike curiosity about the world we live in and you have been using the internet like an archaeological site - to unearth wonderful things and images before sharing them with visitors like me. A marvellous idea. Thank you Yorkshire Pudding. I am happy that you have liked my blog. A word of praise is an incentive to find more such unusual places.